Indulge your senses with 4 relaxing massage treatments to choose from! 4 hand massage totally worth it! The location is at a residential area. Our tuktuk driver got lost and when we arrived, he demanded more money! Such an @$$. ANyways, Cool Sense Spa is clean, and we were served welcome drinks while we got our feet cleansed. The massage room is ensuite with bath, and its a couple room. Very clean! we got there at 8pm, and after our massage, we got a free ride home! So FYI, if you book the lower end massages like Aromatherapy, you can get a free pick up and drop off and most likely get a 20% discount. However, for the 4 hand massage, there's no discount if you purchase directly from them. SO this is the best deal! you can try your luck calling them for a pick up too. 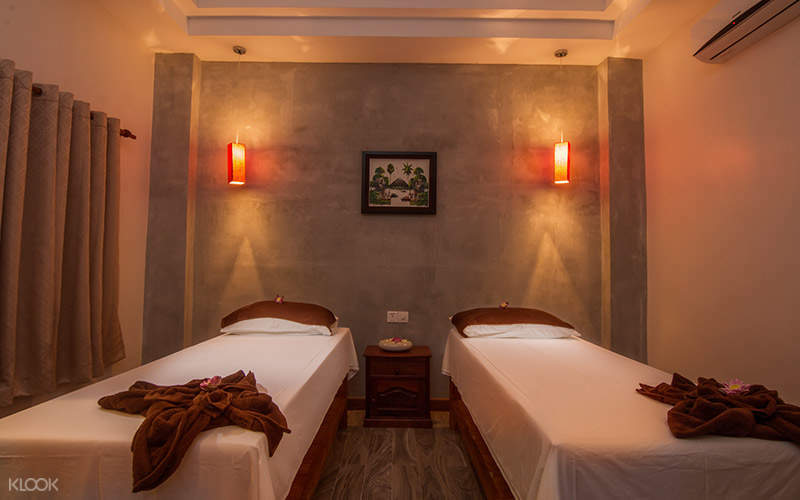 With the large number spa experience offerings in Siem Reap, you might be wondering which out of all the packages would be the best for your needs. 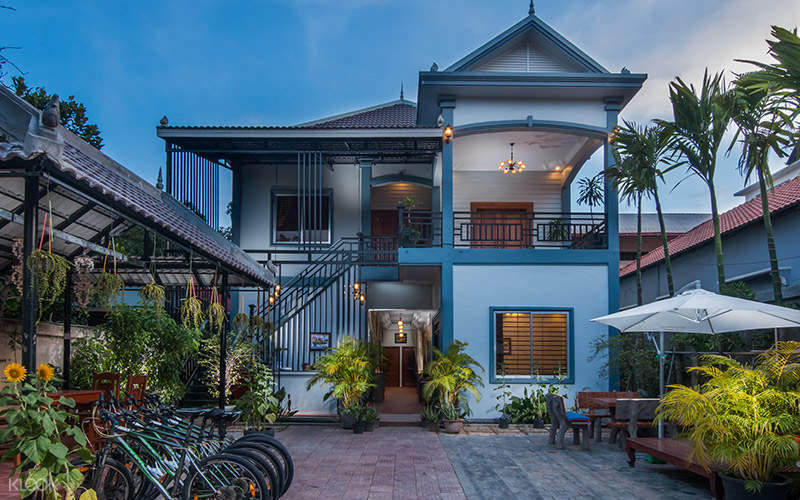 At Cool Sense Spa, a famed spa centrally located within the city, you can relax and indulge in all-natural massage treatments, performed with ingredients locally sourced from Cambodia. Not only do you get organic, relaxing massages, but in the hands of the professional masseuses, you're also assured of exceptional service that will help calm your nerves, improve oxygen and blood circulation and more. With different packages to choose from, pick one that best suits your needs. When you walk out of the spa, you'll feel like a whole new person! Go on a solo spa retreat or take a friend with you for a memorable experience! After a long day exploring temples we booked a 120 minute deep tissue couples massage booked through Klook. We arrived early and were greeted with a cold lemongrass tea and quick foot scrub. After a selection of oil we were escorted to a large room with private restroom. The masseuse was attentive and professionally trained. Once finished we were given a plate of fruit and the most amazing smooth ginger tea! We ended the treatment feeling relaxed and recharged, they even offered to drop us off by tuk tuk. The service was exceptional, perfectly synchronized from arrival to exit. The staff were friendly and the location well maintain with new beds and cleans towels. The location is away from the city center but they can arrange a pickup just call them. Don’t settle for a bad Pub Street “massage” experience. Come and experience the real Cambodia just 10 minutes by tuk. This neighborhood also has many family home restaurants and two large markets (Phsar Leu Thom Thmey & Phsa Samaki ) that are less hassle and better produce than Psar Chaa. After a long day exploring temples we booked a 120 minute deep tissue couples massage booked through Klook. We arrived early and were greeted with a cold lemongrass tea and quick foot scrub. After a selection of oil we were escorted to a large room with private restroom. The masseuse was attentive and professionally trained. Once finished we were given a plate of fruit and the most amazing smooth ginger tea! We ended the treatment feeling relaxed and recharged, they even offered to drop us off by tuk tuk. The service was exceptional, perfectly synchronized from arrival to exit. The staff were friendly and the location well maintain with new beds and cleans towels. The location is away from the city center but they can arrange a pickup just call them. Don’t settle for a bad Pub Street “massage” experience. Come and experience the real Cambodia just 10 minutes by tuk. This neighborhood also has many family home restaurants and two large markets (Phsar Leu Thom Thmey & Phsa Samaki ) that are less hassle and better produce than Psar Chaa. Great spa day! You get tea and light snacks before and after the massage. Overall ambiance was very calm and relaxing. Great spa day! You get tea and light snacks before and after the massage. Overall ambiance was very calm and relaxing. One of the best massage experience for our 4 hands massage. The massage place is very ulu and is about 15min by tuk tuk (USD1.5) from Pub Street (where we stay). But once you reach, the building is nice and calm and clean. After the massage, the owner gave us a free ride back. Will definitely come back again if there’s chance. One of the best massage experience for our 4 hands massage. The massage place is very ulu and is about 15min by tuk tuk (USD1.5) from Pub Street (where we stay). But once you reach, the building is nice and calm and clean. After the massage, the owner gave us a free ride back. Will definitely come back again if there’s chance. It located a bit far from the town area, but the experience was truly enjoyable. The welcome drink and warm ginger tea with mango after spa were good. Further more they offered free tuk tuk ride back to your hotel. A good experience with good price. It located a bit far from the town area, but the experience was truly enjoyable. The welcome drink and warm ginger tea with mango after spa were good. Further more they offered free tuk tuk ride back to your hotel. A good experience with good price. 4 hand massage totally worth it! The location is at a residential area. Our tuktuk driver got lost and when we arrived, he demanded more money! Such an @$$. ANyways, Cool Sense Spa is clean, and we were served welcome drinks while we got our feet cleansed. The massage room is ensuite with bath, and its a couple room. Very clean! we got there at 8pm, and after our massage, we got a free ride home! So FYI, if you book the lower end massages like Aromatherapy, you can get a free pick up and drop off and most likely get a 20% discount. However, for the 4 hand massage, there's no discount if you purchase directly from them. SO this is the best deal! you can try your luck calling them for a pick up too. 4 hand massage totally worth it! The location is at a residential area. Our tuktuk driver got lost and when we arrived, he demanded more money! Such an @$$. ANyways, Cool Sense Spa is clean, and we were served welcome drinks while we got our feet cleansed. The massage room is ensuite with bath, and its a couple room. Very clean! we got there at 8pm, and after our massage, we got a free ride home! So FYI, if you book the lower end massages like Aromatherapy, you can get a free pick up and drop off and most likely get a 20% discount. However, for the 4 hand massage, there's no discount if you purchase directly from them. SO this is the best deal! you can try your luck calling them for a pick up too. Despite the location is bit remote but our Grab tuk-tuk driver has no issue in finding the place via map. It cost about USD 1.50 for a 15mins ride. Warm welcomed by the owner. It’s my first time trying four hand massage and felt refreshing after the massage. They will provide you fresh fruits and ginger tea after your massage. Also, free tuk-tuk ride back to hostel is available. Despite the location is bit remote but our Grab tuk-tuk driver has no issue in finding the place via map. It cost about USD 1.50 for a 15mins ride. Warm welcomed by the owner. It’s my first time trying four hand massage and felt refreshing after the massage. They will provide you fresh fruits and ginger tea after your massage. Also, free tuk-tuk ride back to hostel is available. Tried my 1st time the 4 hand massage, it is not so fantastic as I imagine, it good to try.. the place is no so far from Angkor Wat, good to have massage after those walking.. they provide cold tower before massage and refreshment ( apple and tea ) after massage.. Futher they offer free tuk tuk drop off.. Tried my 1st time the 4 hand massage, it is not so fantastic as I imagine, it good to try.. the place is no so far from Angkor Wat, good to have massage after those walking.. they provide cold tower before massage and refreshment ( apple and tea ) after massage.. Futher they offer free tuk tuk drop off.. Very relaxing and the staffs are accomodating. I will surely comeback to this spa. 15 mins away from the city centre and very quiet place. Very relaxing and the staffs are accomodating. I will surely comeback to this spa. 15 mins away from the city centre and very quiet place.